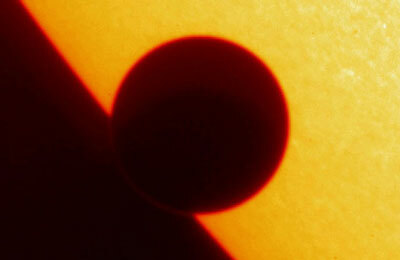 A transit of the planet Venus across the solar disc on 5/6 June is overwhelmingly the observing highlight for 2012. Such transits are among the rarest of predictable planetary phenomena or alignments and you'll certainly want to make the most special effort to see this one as you are unlikely to see another. Transits of Venus occur in pairs eight years apart with more than a century in between and the next pair won't happen until December 2117 and 2125. Only six have taken place since Jeremiah Horrocks predicted and observed a transit in 1639. 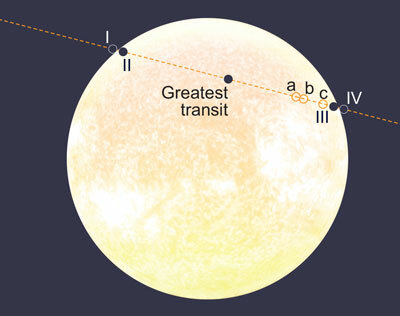 The last transit in June 2004 was a magnificent sight on a glorious day for UK observers but this time the cards have fallen against us and only the latter stages of the event will be visible at sunrise. Every 584 days or so Venus moves between the Sun and the Earth and all three objects are in line (when viewed from above) -- a point known as inferior conjunction. Venus usually passes a little to the north or south of the Sun at inferior conjunction because its orbital plane is angled 3.4 degrees to that of Earth. Precise alignments between Earth, Venus and Sun are therefore rare, but when they do occur Venus appears to transit the Sun's face, appearing as a perfectly black circular silhouette very nearly one arcminute across. So where do you have to be in the world to see the transit and when will it take place? On 5 June the whole of the transit (all four contacts) can be seen from Hawaii and north-western North America. On 6 June north-east Asia, Japan, Korea, eastern Australia and New Zealand are in luck. The precise moment when Venus touches the outer solar limb signals the beginning of the eclipse, the first contact. Some 18 minutes later Venus, travelling at an angular velocity of four arcminutes an hour, crosses the solar limb and second contact occurs with the whole of the planet silhouetted against the Sun's disc. Third and fourth contacts are mirror images of the start of the transit, with the latter signalling the end of the eclipse, when the following limb of Venus is no longer touching the Sun's western edge. Where and when in the world the transit of Venus can be seen. 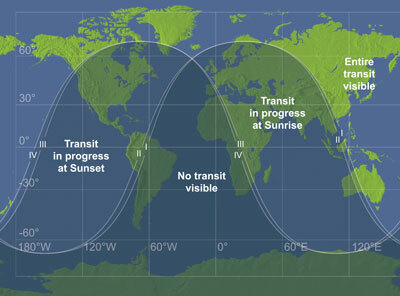 The transit in progress at sunset takes place on the evening of 5 June from those locations, while the transit taking place at sunrise is on the other side of the date line, on 6 June. AN graphic by Greg Smye-Rumsby. For us in the UK first contact is at 11.09pm BST on 5 June and by the time the Sun rises on the morning of Wednesday 6 June, the eclipse will be almost over. In London the Sun rises at 4.45am and third contact occurs at 5.37am, with the Sun a mere six degrees up and only eight degrees by fourth contact at 5.55am. The timings and solar altitude are almost identical across the UK but in any event, a good, clear north-eastern horizon is essential. Venus' path across the Sun on 6 June 2012. Only the later stages (third and fourth contact) are visible from the UK as the Sun rises. The position of Venus at sunrise is given as: a = Edinburgh, 4:30am BST, b = London, 4:45am, c = Penzance, 5:15am. Roman numerals I, II, III and IV indicate first, second, third and fourth contact with the inner and outer edge of the Sun's disc. AN graphic by Greg Smye-Rumsby. If you are blessed with a clear sky then what is there to look out for? A phenomenon known as the 'black drop' gives the impression of a ligament of darkness extending from Venus' trailing limb to the Sun's edge, making Venus appear like a droplet of black ink suspended from the edge of the Sun. The black drop produces some uncertainty in individual timings of the moment of second and third contact. As the planet leaves the Sun, an arc of refracted sunlight can be traced around Venus' preceding edge, caused by refraction in the planet's thick atmosphere. If you are viewing the solar disc in hydrogen-alpha light you will be able to follow Venus for some time afterwards and even after fourth chromospheric contact Venus may be seen silhouetted against the diffuse hydrogen-alpha glow or possibly prominences. Of course the same effects can be seen at first and second contact. As mentioned above, certain parts of North America and the Pacific will see the whole of the transit. For much of North America the Sun sets whilst the transit is in progress but the bulk of South America will miss out entirely. Many observers will head for Hawaii as all of the transit is visible with the Sun overhead around the time of first and second contact at 12.10pm and 12.28pm on 5 June. The Sun has sunk to 50 degrees up by mid transit at 3.26pm and is only five degrees above the horizon at the end of the eclipse at 6.45pm. If you prefer colder weather then Alaska may be more to your liking; the whole transit is visible from Anchorage from 2.10pm to 8.49pm with the Sun's altitude varying from 50 degrees to 14 degrees. Canada's North West Territory is another place to see the entire transit. The view from the west coast of the United States is pretty good; from Los Angeles, San Francisco and Seattle the Sun is above 50 degrees for first contact at 3.06pm but it has dipped to just under 20 degrees by mid-transit at 6.26pm. Unfortunately the Sun has set by the time of third and fourth contact. The situation deteriorates the further east you go; from Chicago and New Orleans first contact is around 5.05pm with the Sun a healthy 35 degrees up but has set by the time of mid-eclipse, only by a matter of a few minutes though in Chicago. On the east coast New York and Miami will see first contact at 6.04pm with the Sun 25 degrees up. Heading east into Europe on the morning of 6 June, most of the transit has already taken place and is in progress at sunrise. Amongst the best spots in terms of the Sun's altitude is Warsaw in Poland, where third contact is at 6.37am with the Sun nearly twenty degrees above the east-north-east horizon. Moscow is better placed with third contact at 8.37am and the Sun nearly 30 degrees up. If you are looking for a better chance of a sunny morning then maybe Athens is a good bet, with the eclipse ending at 7.56am while the Sun is has climbed 20 degrees high. Give Portugal and southern Spain a wide berth, as none of the eclipse is visible there. Observing the Sun under any circumstances can be very dangerous unless certain simple, basic rules are followed. Never look directly at the Sun with the naked eye, no matter what altitude in the sky it is and whether is seems safe enough when enshrouded in mist or thin cloud. Never look at the Sun in binoculars or a telescope unless with special whole aperture filtration with a visually safe aluminised Mylar or Inconel glass filter or the use of a specialist accessory known as a Herschel wedge. Eyepiece projection onto a white card or wall is a tried and tested safe method too. It is essential that children especially, have drilled into them the very real dangers the Sun possesses. Venus will be large enough to see in transit by keen-eyed observers without magnification but eyes must be safely protected by the use of special 'eclipse glasses', which have a thick layer of aluminised Mylar to prevent the Sun's heat, white and ultraviolet light damaging the eye. Ordinary sunglasses, welder's glass or layers of photographic negatives sandwiches together are totally unsafe and should never be used. Never use the eclipse glasses to view the Sun through unfiltered binoculars or telescopes though, as the Sun's heat will melt them and burn through them causing serious eye damage and maybe blindness. It just remains for me to wish observers around the world good luck and clear skies! !